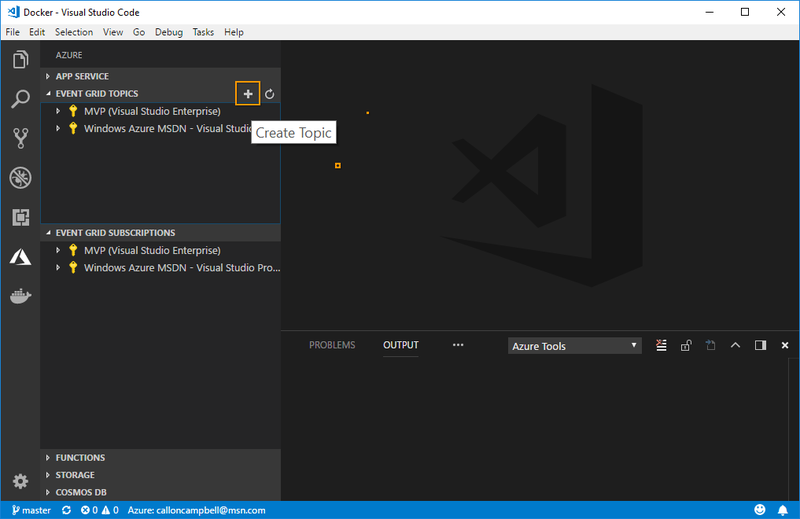 I love Visual Studio Code and all the extensions that are available. 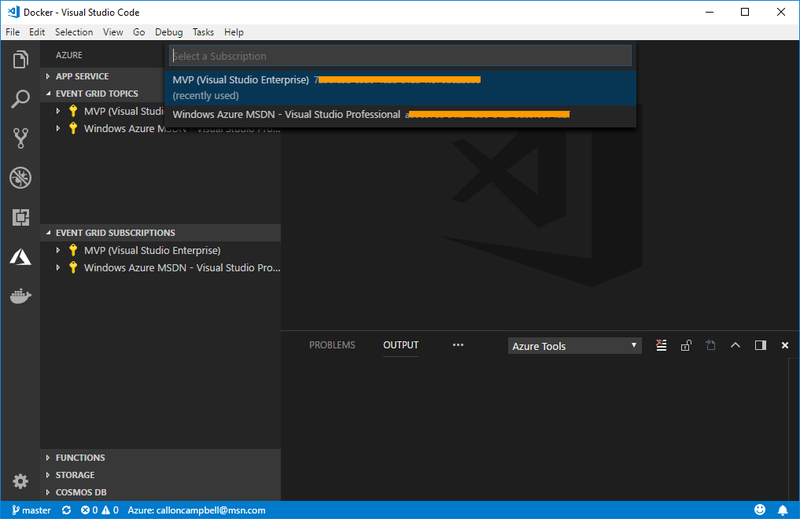 It has become my preferred editor for almost everything (replacing Notepad++), except for when developing in Visual Studio. 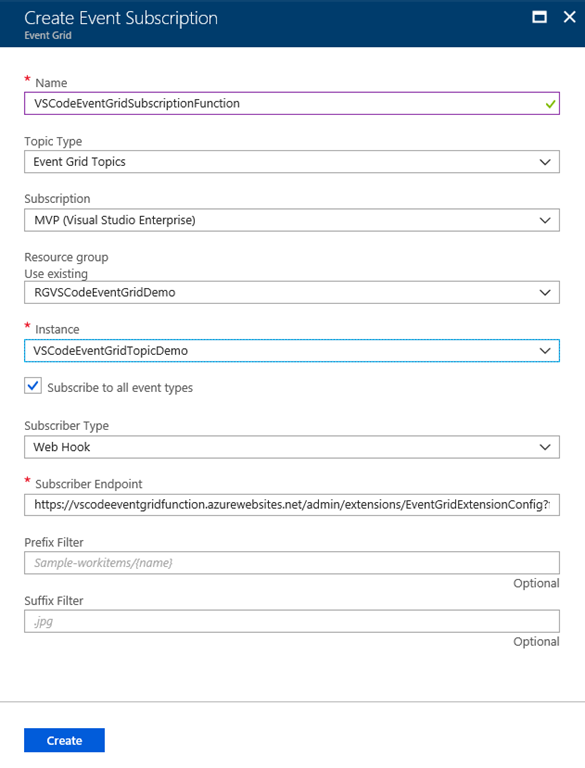 Recently there is a new extension that was made available for working with Azure Event Grid. Typically when working with Azure Event Grid I use a tool called Postman to send test messages to my Azure Event Grid resource. 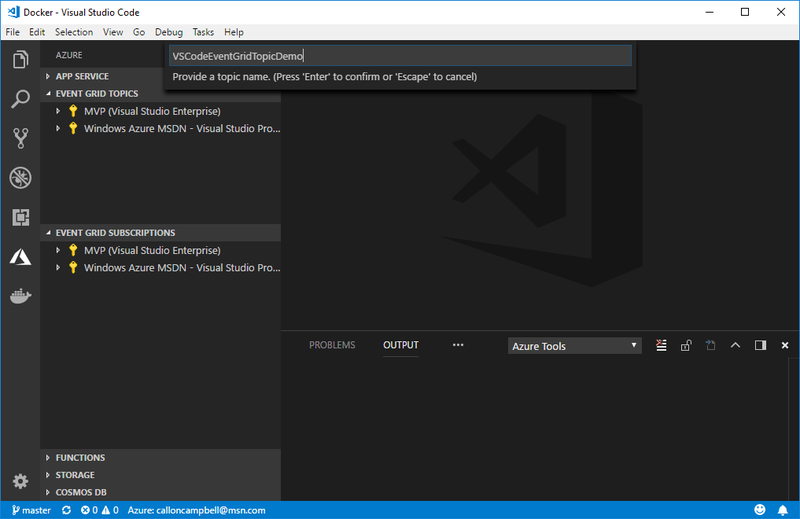 But now with this latest extension you can use Visual Studio Code. 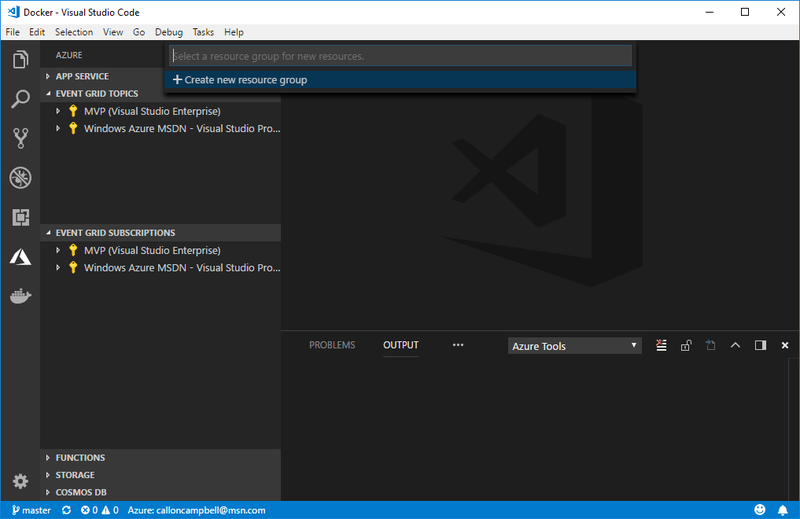 In this post I’ll walk through how to get started and use the Azure Event Grid extension for Visual Studio Code. Let’s get started. An Azure Subscription. If you don’t have an Azure Account, you can sign up for one today for free and receive $200 in credits by selecting "Create a Free Azure Account…" or selecting "View->Command Palette" and searching for "Azure: Create an Account"
First thing we need to do is connect to your Azure subscription. 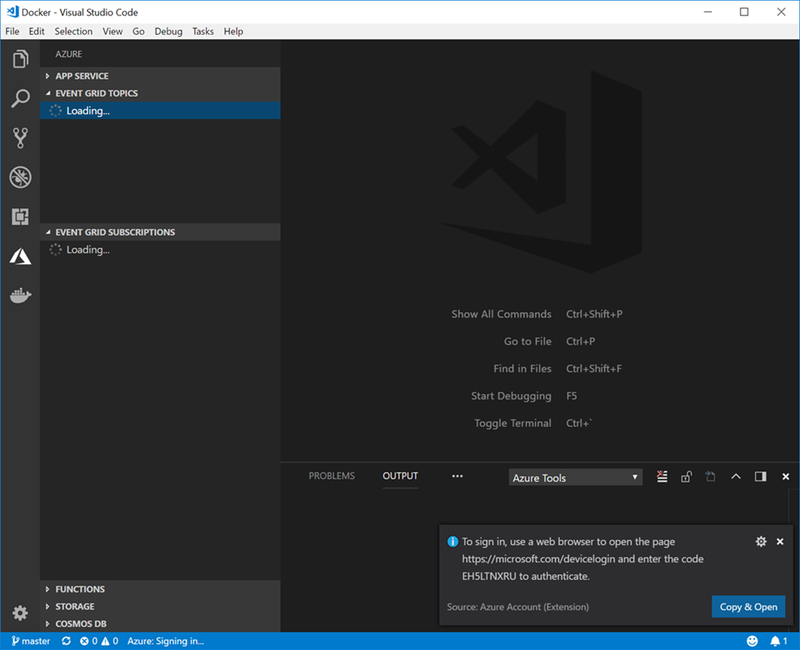 This will happen automatically when you go to the Azure tab in Visual Studio Code. 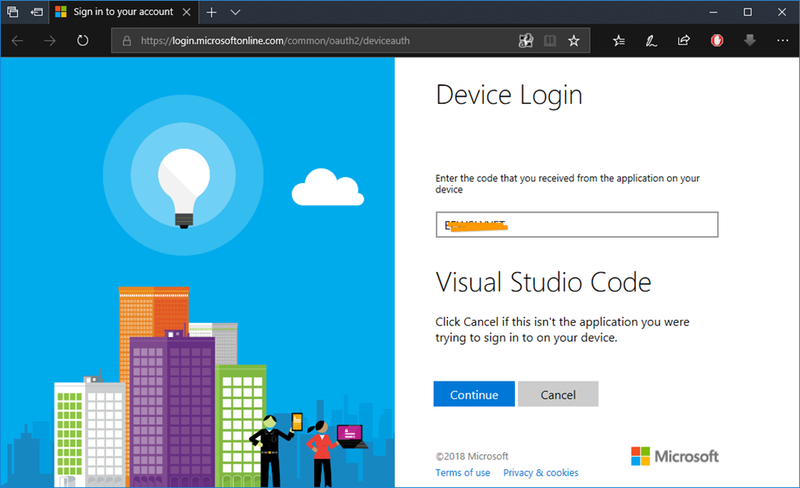 You can also sign in from the Command palette and searching for “Azure: Login”. Now that you’re signed in, let’s go ahead and create an Event Grid topic. You can login to your Azure Subscription and see everything we just created. 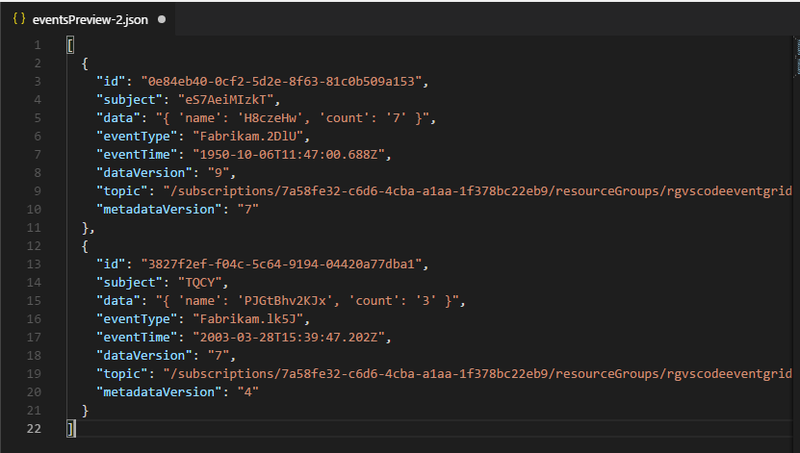 Keep your Azure Subscription loaded in the browser as we’ll use it for the next section. Now that we have an Event Grid Topic setup we need to create a subscription to receive the events we send it. Your Event Grid Topic now has an Event Grid Subscription and is ready to test! 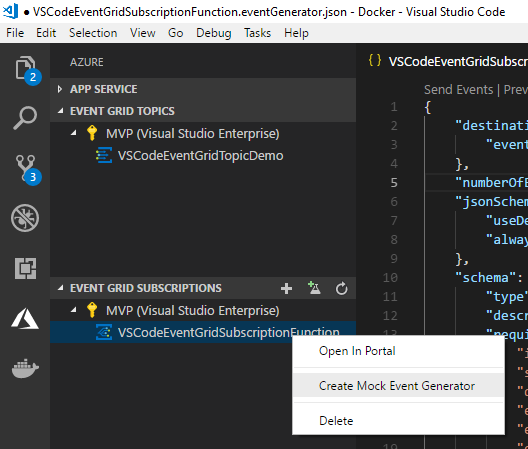 Apart from managing your Event Grids resources in Visual Studio Code, you can also generate and send mock events which is great for testing purposes. Instead of using Postman to do this, I find the Event Grid Extension better and mocking and sending events. So let’s get started now mocking some events. 3. At the top of the event generator file will be two links: Send Events and Preview Events. The actions do exactly as they say and are what you want to use when generating your mocked events. 4. If we click on Preview Events, another file is created with a preview of mocked event data to be sent. Notice the different values between the events. This is from the regex logic defined in the event generator. This can be customized to generate data appropriate for your needs. As you can see the Azure Event Grid extension for Visual Studio Code is very powerful and is a handy tool to use in your Azure development. 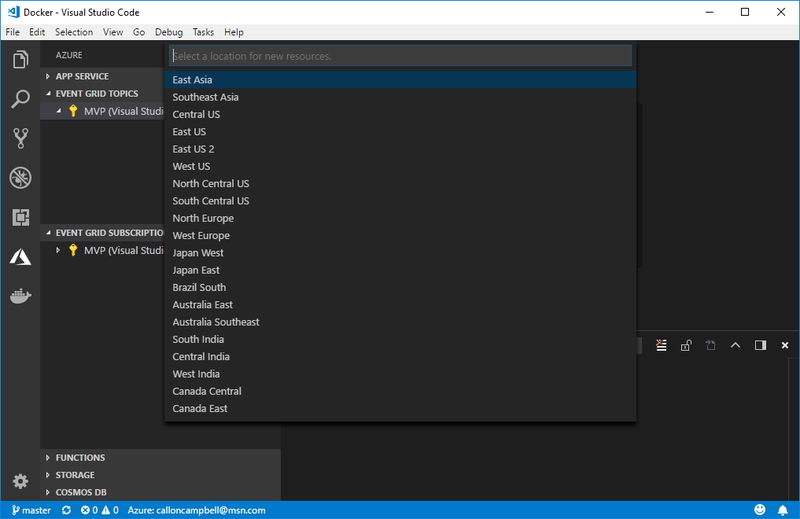 UWP XAML Islands, which lets you incorporate UWP into WinForms, WPF and Win32 applications. This also means you can start to bring in the Fluent Design System into these UI frameworks. 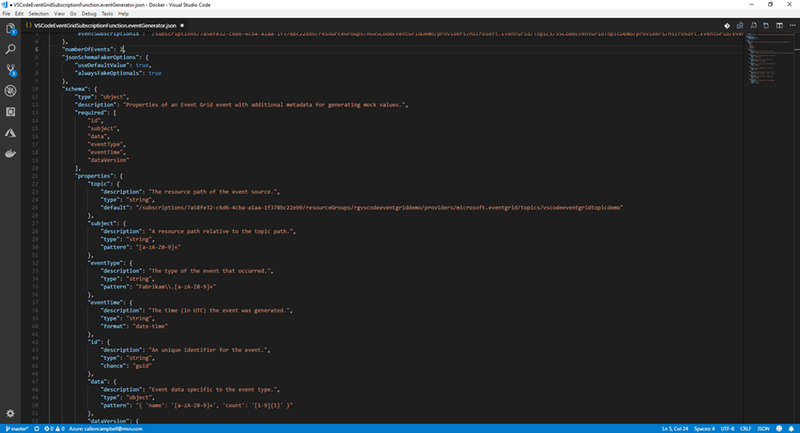 Windows UI Library, which brings native platform controls as NuGet packages instead of being tied to the OS version. This will work from the Windows Anniversary Update and newer. .NET Core 3.0, which will support side-by-side runtimes, along with support for WinForms, WPF and UWP. MSIX, which is dubbed the best technology for installing applications on Windows. This inherits the Universal Windows Platform (UWP) features, works across Enterprise or Store distributions, and supports all Windows applications. New developer revenue sharing model. Developers will get 85% when their app is found in the Microsoft store, and 95% when you provide your customers to your app in the Microsoft store. Microsoft Launcher on Android will support Timeline for cross-device application launching. On iOS this will be supported through Microsoft Edge. Microsoft Sets was officially shown and demonstrated how it can be used for an easier way to organize your work and allow you to get back to work where you left off when ready. This means not having to have 25+ tabs open in Chrome or Edge. Nice! Adaptive Cards is being added to Microsoft 365, which will enable developers to create rich interactive content within conversations. They demonstrated a GitHub Adaptive Card for Outlook (365) where you could comment and close an issue. Another example shown was paying for your invoice from an email. 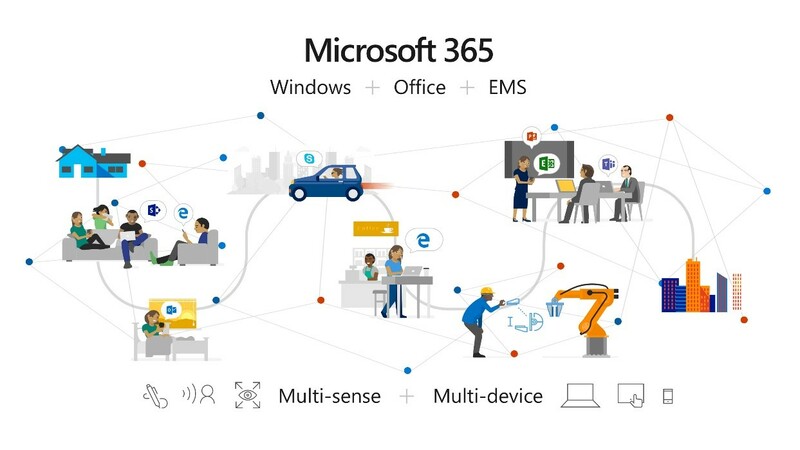 There was a lot of buzz for Microsoft Graph, which is core to the Microsoft 365 platform. Microsoft Graph helps developers connect the dots between people, schedules, conversations, and content within the Microsoft cloud. Cortana and Alexa start speaking to one another. Sometime in the future you will be able to access your Alexa device through Windows 10 and likewise on an Amazon Echo you will ne able to speak to Cortana. 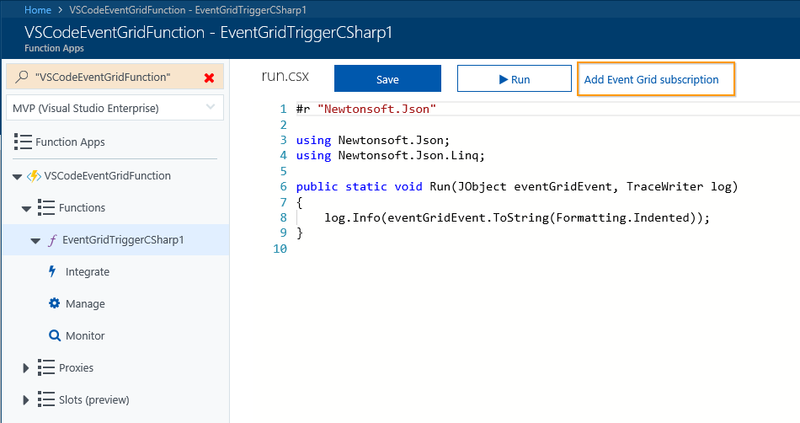 Azure Functions now have 2 different runtimes, version 1 which is what is currently in production and the only runtime supported for production use, and version 2 which is currently in preview. I’ll cover the difference in both runtimes and when to use which version. 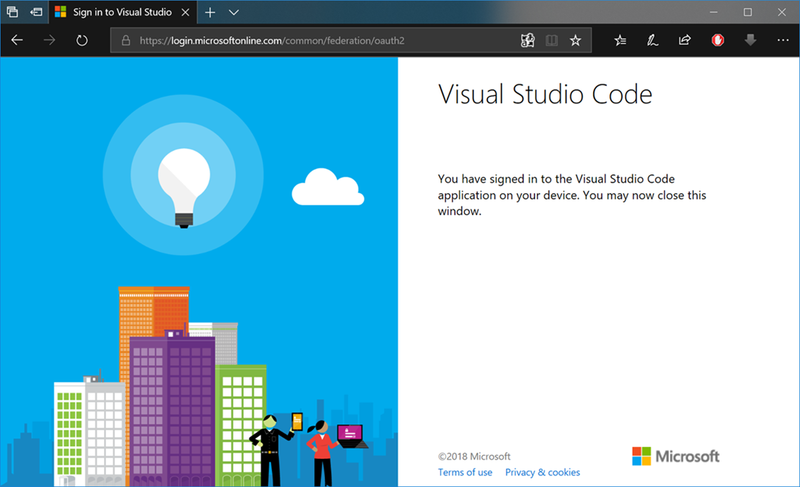 Version 2 runtime has been rebuilt from the ground up on .NET Core 2.0 and support cross platform (Windows and Linux) for deployment and for development you can use Windows, Linux, and macOS. 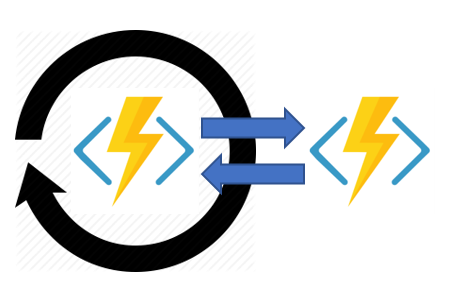 Azure Functions is a great serverless offering and provides lots of functionality for almost any application. 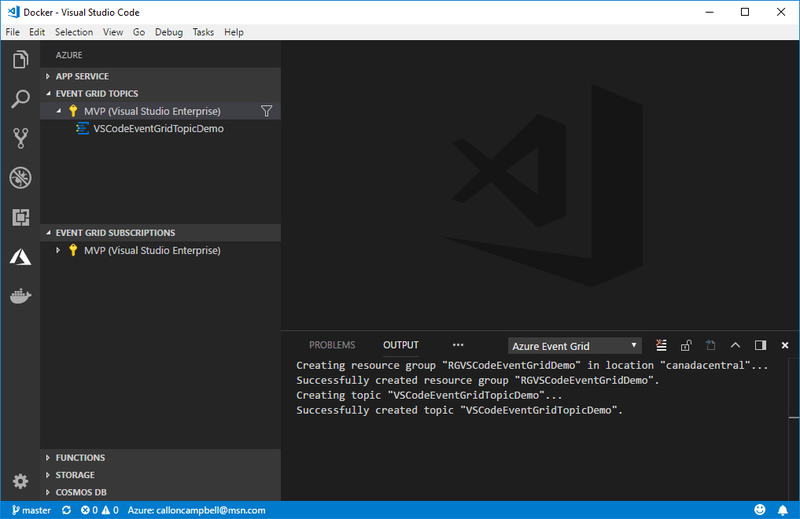 If you need to run code in production than version 1 is your only choice, but if you want to try out Azure Functions then definitely take a look at both runtimes. With Microsoft annual developer conference Build next month, I bet we will hear more information about version 2 runtime and a timeline for release. Workflows are defined in code. This means no JSON schemas or designers are needed. Other functions can be called synchronously or asynchronously. Output from functions can be saved to local variables. Automatic checkpoint the progress of the function whenever it awaits. This means local state is never lost if the process recycles or the VM reboots. The following are 5 sample patterns where Durable Functions can help. Function chaining is the execution of functions in sequence where the output of one function is the input to another function. With this pattern you typically use queues to pass state from function to function. Fan-out/Fan-in refers to the execution of multiple functions in parallel and then waiting for all of them to finish. This pattern also uses queues to manage state from start to end. Fanning back in is much more complicated as you would have to track the outputs of all the functions waiting for them to finish. Async HTTP APIs pattern is all about the problem of coordinating the state of long running operations with external APIs. With this pattern you often use another status endpoint for the client to check on the status of the long running operation. The Monitoring pattern is a recurring process in a workflow where the function polls for a certain condition to be met. A simple timer trigger could address this but its interval is static and management of it is more complex. Finally we have the Human Interaction pattern. This pattern is where a function executes but its process is gated based on some sort of human interaction. People are not always available or respond in a timely manner which introduces complexity to your function process. In all five use cases, Durable Functions provides built-in support for easily handling these scenarios without the need extra resources likes queues, timers, etc for managing state and controlling the function flow. For more information on each of these patterns and code samples please see the Durable Functions documentation. 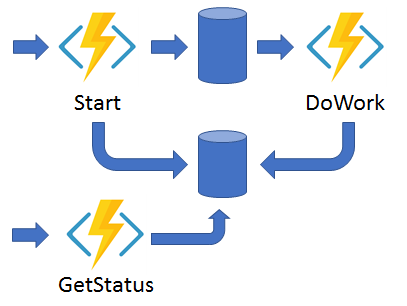 Durable Functions is currently in preview and is an advanced extension for Azure Functions that is not appropriate for all scenarios. 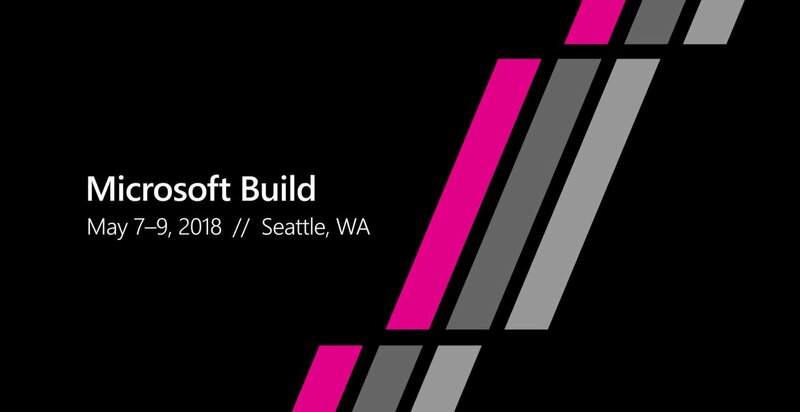 Next month is the annual Microsoft developer conference Build. I suspect we’ll see some new exciting details with Azure Functions and Durable Functions specifically. Hopefully they become generally available. Today Microsoft has announced that they will be offering a free $100 annual credit + 25+ free products to eligible students to help encourage them to build cloud apps for Azure and you pay nothing. For students seeking the skills leading to the most opportunity for cloud based careers, Azure offers students and educators across the world the resources they need. This offer is different compared to the current free Azure Credits offers in that no credit card is required, students simply verify their student status to take advantage of this offer. In addition to this free credit, students can also get 750 Hours of Linux Virtual Machines, 250GB of SQL Database, 10 mobile or web apps, 1 million Azure Function requests and so much more.